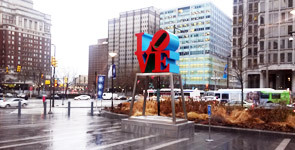 New at Dilworth Park: The LOVE Sculpture! During the reconstruction of JFK Plaza/LOVE Park, you can find Robert Indiana's iconic LOVE sculpture just across the street in front of historic City Hall! Stop by and visit the sculpture in its temporary home at the northwest corner of Dilworth Park. Taking photos? Tag them #LOVEatDilworth, so we can share them on the @CCDParks Twitter and Dilworth Park Facebook. Experience Philadelphia at 833 feet above the street. The One Liberty Observation Deck offers a 360-degree view of the city, 57 stories high. Show your Philadelphia Flower Show ticket stub and get $2 off general admission. Valid March 5-13 at their ticketing desk. South Moon Under gives a nod to its roots with their swimwear sale. What began in 1968 as a small surf shack in Ocean City MD has grown into an upscale retail chain known for its sophisticated fashions. Take 15% off all swimwear March 9-28. There will be Instagram giveaways, gifts with purchase and more. The first documented St. Patrick’s Day Celebration held in Philadelphia was in 1771. Come celebrate this 245-year-old institution on March 13 with a parade along the Benjamin Franklin Parkway. To learn more about the event, visit PhiladelphiaStPatsParade.com. Govberg Jewelers opened in 1916 on South Street. Nearly 100 years later, Govberg Jewelers is celebrated as a true Philadelphia icon, bringing exquisite timepieces, beautiful jewels and exceptional service to the people of a city rich in history and tradition. Their annual winter sale runs March 5-12, with savings of up to 70%. Join the Temple University Institute on Disabilities and storytelling experts from First Person Arts as they help you craft a personal story about some of our first friends and enemies: our siblings. Through guided writing exercises and creative storytelling prompts, you'll uncover true tales about how disability affects family, while connecting through shared and unique experiences. Workshops are free, but registration is required. All participants will be invited to perform at the culminating Sib Slam event on April 13 at Christ Church Neighborhood House. The next Center City-based workshop is March 19, at Friends Center.